In the Europe of 1563 they didn’t bother to define it. Almost everybody was at least nominally Christian. They assumed they knew what “everlasting life” meant. Today people might reasonably wonder. Look around and you’ll find multiple opinions. Some have a standard Christian-ish assumptions, no matter how tenuous their connections to the Bible. 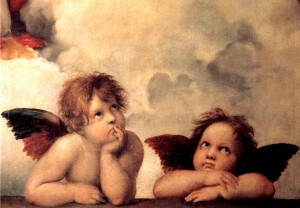 Think stereotypes: playing harps, lounging on clouds, turning into angels. A few pay big bucks to have their bodies kept in the deep freeze so they can be thawed out and revived when medicine has made necessary advances. And many envision a purely secular eternity: they hope their lives makes a big enough splash that someone, anyone, will remember them. Having their own Wikipedia page would be hitting the big time. Christian teaching, all of it and every part, is supposed to be deeply helpful, giving us confidence in God’s care as we live out our days as people of faith. But when it comes to everlasting life, as I said, things have changed since the Reformation. Let’s admit that some, probably even a subset of Christians, do not find the idea of living forever comforting at all. They may have found their life miserable — they just want it to end. They may have lived out their most important hopes and dreams — they are simply done. They may have a totally atheistic and materialistic worldview, and expect nothing but — well, nothing. a blessedness in which to praise God forever. How is Everlasting Life Comforting? I suspect that this rings perfectly true for many Christians. We have tasted joy in Christ, in the midst of earthly struggles. It is wonderful to think of that joy in fullness, undiluted, unending. The weakness of Heidelberg’s response is that it comes close to a quiet capitulation to the Western ideals of individualism and personal fulfillment. It is about me, my joy, my blessedness, even if it specifically directed to continuous praise of God. My hope in eternal life expands when I listen to Gregory of Nyssa, the great four century theologian who shaped the East. In his great book The Life of Moses, Gregory takes the Exodus narrative as a model for our spiritual growth. Moses climbs up the mountain, closer to God. It led to genuine transformation — he glowed in the dark afterward. To Gregory, our life here on earth is about growing intimacy with God so that God’s good work is done within us. The tarnished image of God is restored, and we shine with God’s glory. We actually become more like God. It is constant movement toward God, constant transformation to be more like God. And since God is infinite, and we are finite, there will always be room for further transformation. Further indeed. Further up! Further in! That’s what comforts me in life everlasting. I’d love to hear from you in the comments. How do you (or don’t you) find the promise of life everlasting to be a comfort? Liturgics aside, I’ve really been comforted by N.T. Wright’s “Surprised by Hope.” The idea is that we don’t die to go to heaven, but we die (united to Christ) so that we can be transformed and renewed in the resurrection! I think that’s profound! Thanks for this. Honestly, the idea of everlasting life and ‘eternity’ has been pretty frightening. I always imagined it as a static existence. Nothing changes. I get this feeling that even though it would be ‘perfect,’ without change, even perfect can get boring. This idea of transformation and growing closer to God continuously helps. It is still scary to me for some reason. I cannot get the my head around the concept of ‘infinite,’ and I don’t like that.